Guadalupe Mountains National Park (NPS website here) is a relatively small and quiet national park in far West Texas, bordering New Mexico. It is the world’s most extensive Permian aged reef and hosts the tallest point in the State of Texas. Guadalupe Mountains has five main points from which you can enter. All of our posts for GMNP will reference which entrance needs to be used to get to the area on which the post is based. If you plan on hiking, you can pay usage fees at all of the trailheads, so unless you plan on camping, you don’t need to visit park headquarters to get into the park. Just fill out the envelope at the trailhead and put the stub on your vehicle dashboard. 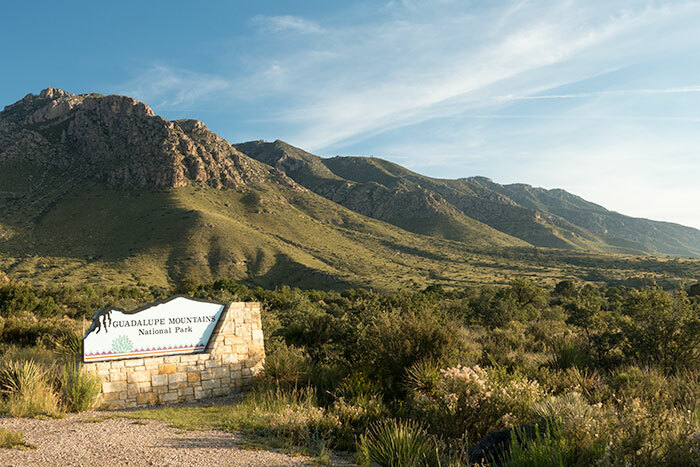 Guadalupe Mountains National Park only has two campgrounds; Pine Springs and Dog Canyon. Although, as the buzzard flies, Pine Springs Campground is only about 6.5 miles away from Dog Canyon Campground, its a two and a half hour, 102 mile drive from one campground to the other. Dog Canyon is a very remote location in the Northern portion of the park, while Pine Springs sits just off of U. S. Hwy. 62/180. It takes an extra hour or more of driving to get to Dog Canyon as opposed to Pine Springs, regardless of which direction you’re coming from. Pine Springs Campground – 20 tent sites, 2 group sites, and 19 RV sites. 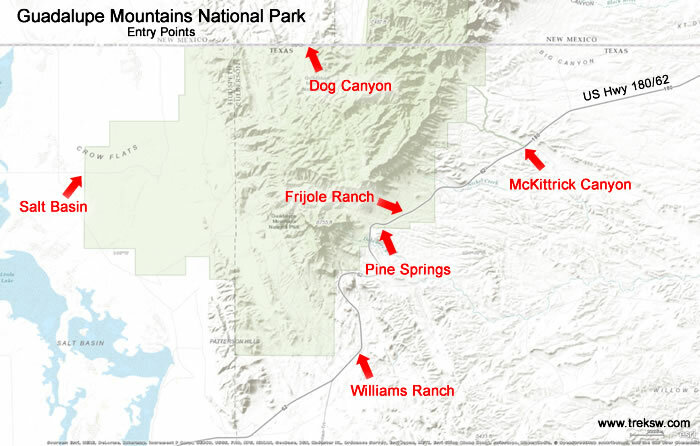 Dog Canyon Campground – 9 tent sites, 1 group site, and 4 RV sites. Restrooms are available in both campgrounds, but no showers or RV hook-ups are available. 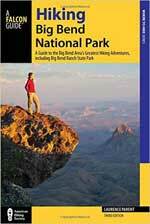 You can find more information on the NPS site here. Of course we have a ways to go, but below are our trail guides from the park.